This is arguably one of the most hyped sneakers I’ve purchased this year but more importantly it’s one of my favourite ones. I broke these shoes out for a couple of months ago, but I recently got a good feel for them in my Montreal trip. You can check The Fit Break Down Post by clicking that link and check out the IG Post below. But first, to see why it’s one of my favourite read below! When it comes to “hype” sneakers, it is often due to its limited run or endorsement. However, with Atmos, I feel that the design and execution is always well thought of and perfectly executed. I’ll talk more about aesthetics later but it truly is a loud sneaker that tells it’s own story. From the moment it was announced these shoes would release I immediately wanted the 95s. That is my preference because in my opinion, it was better executed and the story is expressed better through this silhouette. Take a look on the concept and story behind these beloved sneakers below from the designer himself, Fuji. The size and fit on these shoes are simply true to size. If you go half a size down lower I don’t think it would be a problem as it will probably expand enough for you to get a good snug fit and still be able to put your feet in. However, I just recommend staying true to size. The fit is good, nothing special in terms of technology as the 95s are a retro silhouette as people forget that these were the new runners back in the day. Therefore, after a while your feet will soar especially if you’ve been walking the whole day. Just like the Sean Wotherspoon’s Air Max 1/97, as soon as I saw images of these particular sneakers from ComplexCon 2017 I knew I had to try everything I could to cop a pair for myself. In case you haven’t pick it up already, I’m a sucker for detail. There are 5 different animals featured on this shoe. Leopard. Tiger. Zebra. Giraffe. Horse. 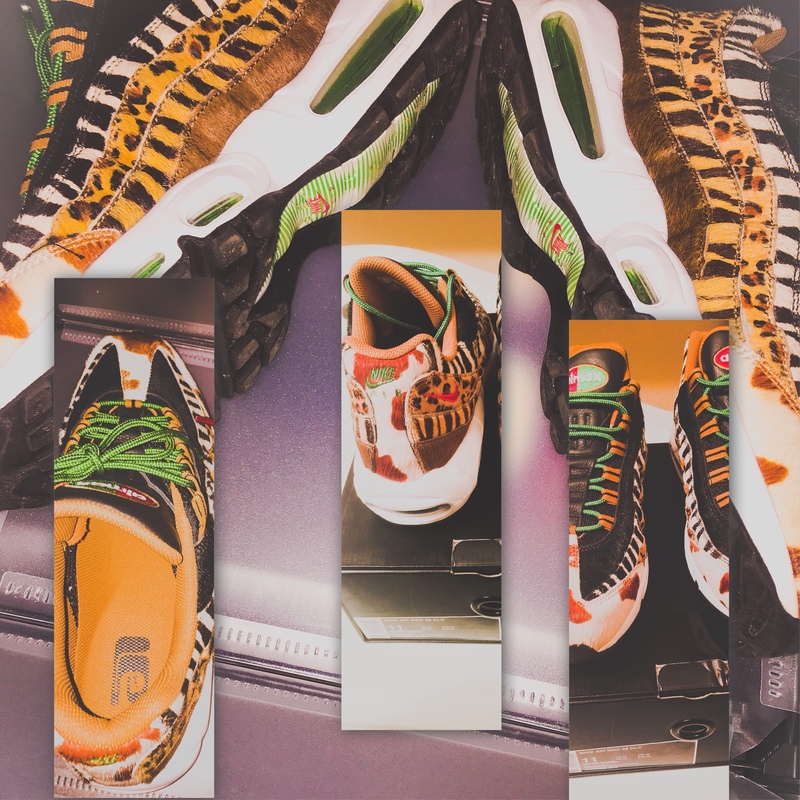 With the Classic silhouette known as the Nike Air Max 95, the five different animals are represented flawlessly. More than that, it’s a really loud shoe that really stands on its own but also compliments any animal print clothing you have. The only thing I didn’t like was the material used when I had it in my hand. I wish it was a faux leather or something else but I guess to make it look more animal like they went with this pony hair type material. Being the person I am, I like to share good news and help others. So if you’ve been following me since the beginning of this blog I actually shared how you can cop a pair just like I did. If you haven’t seen it, check out the post here. Unfortunately, Shelflife doesn’t have it anymore as like other places it sold out! (Just not as quick). Nonetheless, you are still able to buy a pair from Stadium Goods, Grailed and more. Check out Stadium Goods listing now and subscribe to be informed of their next sale (usually one day for 15% off) as the price has decreased a bit. Comfort? True to size. No extra comfort, so after a while might ache like any other shoe would. Aesthetic? Concept and visual execution was beautiful but with respect to the material, I felt could’ve been selected better. Retail: Reasonable, if you were to buy it off CAD or US retailers for the retail price. Resale: High. Although I technically paid retail because I copped directly from Shelflife, it was still listed a bit above other retailers. In addition, because the South African Rands gets converted to USD then to CAD it became a little expensive, with shipping. Thankfully no duties and it was still cheaper than resale. However, I feel that you can still cop at a resale value for not too much if you monitor the price on StockX or Stadium Goods. Packaging? A bit better than basic, since it came with extra laces. Unfortunately, this was a regular black box packaging and not the animal print. All in all, these were a pair of sneakers that I truly enjoyed and one of my favourites in my collection. I still can’t believe I had a second chance at copping for retail. Stay tuned near the end of the year to see if this will make my Top 10 list! What are your thoughts on these? Would you cop? Let me know in the comments below and don’t forget to subscribe!